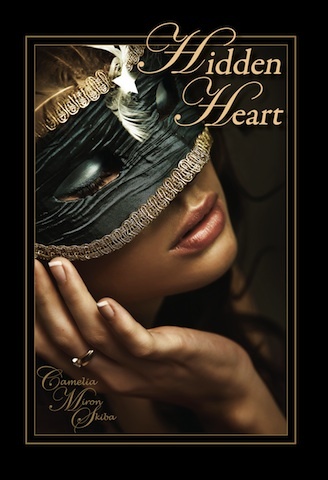 Here we are almost 5 years into my writing and 3 since my debut novel HIDDEN HEART saw the daylight. 4 novels later I’m still arguing with my heroes, finding new ideas in as much as a photo and continuing on this journey of writing romance. Tessa bent over the balcony’s banister and looked into the darkness below. Her feet hurt. Dancing for an entire hour on high-heels no longer seemed like a good idea. “Nice evening. Would you care for some champagne?” asked a thickly accented Italian voice. Tessa straightened and turned. To her surprise, a handsome stranger stopped close to her, a bottle of champagne in one hand and two glasses in the other. The same stranger from the sky gondola, the same man she’d clung to for dear life only hours ago. “You speak English!” Her voice sounded jittery and she hated it. Oh, God, I’m in trouble, so much trouble! Telling him earlier what she’d do with him, to him was one thing; him understanding was different, totally different. Butterflies filled her stomach and her heart drummed like the staccato bass of the music. Her cheeks burned with embarrassment as she covered her face with both hands, then peeked through her fingers. A playful spark ignited his dark eyes while he tried to conceal a grin, failing miserably. He poured champagne in one glass and offered it to her. She accepted it with shaky hands, and took a sip. Sweet, bubbly, expensive—her taste exactly. Words had never failed Tessa. Would she ever regain her voice? Coming out of his mouth, English never sounded more alluring spoken with the sensual Italian accent. He tilted his head, took her extended hand, lifted it to his lips and kissed it with infinite gentleness. His lips felt warm and smooth on her hand, a touch that made her stomach tighten. Under any other circumstance, Tessa would’ve thought the gesture old fashioned, and perhaps would’ve burst out laughing, but coming from this man, it seemed smooth, gracious and right. “I always wanted to see the ruins of Sarmisegetuza and hike the Carpathians.” Alessandro brushed a hand through his hair then sampled his champagne. His eyes never left her face. Is he hitting on me? Alessandro seemed a remarkable, intelligent man. Too bad she didn’t believe in long-distance relationships. Grateful he tried to make her comfortable and forget about her blunt outburst hours ago, Tessa knew she needed to clear her name.